Mom life is full of adventure filled tasks, love and hacks to make life less stressful. Going grocery shopping is something that I have a love/hate relationship with. There are so many challenges when bringing your little ones along and trying to save money. 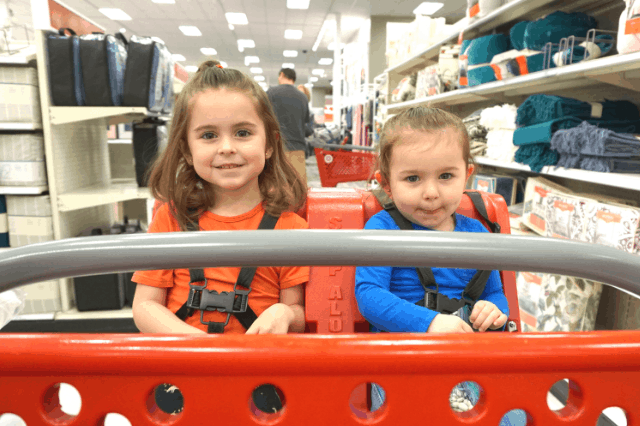 I’ve put together 3 of my favorite hacks while grocery shopping with my littles. Always bring snacks with you while shopping. I put their snacks into the fun snack-sized plastic bags with their favorite characters on them. I pack them into a wet/dry bag to keep spills from happening and to double as a “just in case” bag if any little ones have accidents. If you are grocery shopping and forget a snack, visit the produce section for the selection of free samples of healthier snacks. Saving money by choosing Store Brand Formula. Store Brand Formula is nutritionally comparable to nationally advertised brands but costs up to 50% less. It’s called formula for a reason. Infant formula is regulated by the FDA, which means that all ingredients need to meet specific nutritional standards – that means that all formula brands contain comparable essential nutrients to make sure baby stays healthy and received nutrients to grow. So what is the main difference between these baby formulas? The truth is it comes down to a single word: price…that’s it! Go for the big bag vs. the convenient bags. Unfortunately, for the convenience of grab and go- you’ll pay twice the price! I save the money by portioning them out into their snack bags. Having items in ready-to-go snack sizes is perfect for my kids. I have a section of the pantry at their level to grab-and go when quickly heading out the door. I try doing the grocery shopping when my boys are at kindergarten and preschool. It makes it so much easier. But, when I can’t go on days they aren’t home, I always pack a snack. I’ve also grabbed some of their favorite snacks and opened them as we shop then pay for the empty container when I checkout if needed. The stores we go to don’t have samples, so that isn’t an easy option for us. This is absolutely great….considering I a Mommy blogger as well this spoke to my heart! I am so glad that someone is finally not mommy shaming for buying store brand formula. I was so hesitant with my first because I truly thought that store brand couldn’t be as nutritional but after much research I learned it is the same. This mommy buys store brand and there is no shame! Great tips! We’ve gone for reusing bags now because it’s cheaper and better for the environment. We learned very early on having snacks makes it very peaceful! Thank god for samples too! We did not have the problem with bringing snacks, because most of the places we shopped when the kids were little had either free samples throughout the store, and/or a free piece of fruit for kids. So I often tried to plan our trips around lunch time (when I had already eaten) so the kids’ mealtimes wouldn’t get messed up, and they were happy that they got little snacks throughout the store (generally healthy things at the stores we went to, thank goodness!). Now that they are older, I (like Stephanie) just go when they are in school LOL! I don’t have kids but I like to get store brands because they are cheaper than the regular ones. I love mom hacks. Lately I’ve been going grocery shopping at night. It’s so quiet and much faster without a toddler. Lol. Thanks for these useful tips! Should share this with my sisters. I wasn’t brave enough to take my kids grocery shopping so I planned to go when they were in school. Great tips! Wow! That really helps us. I love those tips you share with us. Thanks for the share! Yes! We have definitely learned that the convenient things cost way more in the long run. We also just buy bags that can portion out the snacks ourselves.